It’s been a busy four days since we arrived in Long Island for the second time this season. On Thursday, we did a little grocery shopping and then went to the Long Island Breeze Restaurant for Happy Hour. With so many cruisers on the island, we are happy to support this restaurant which provides so many services to us while we are here. We can drop off our garbage for free, get wifi with the purchase of a soft drink or more, do our laundry, take showers, swim in the pool, drop off our propane tanks to be filled, listen to the morning Cruisers’ Net hosted by Mike (Island Breeze co-owner), and of course eat and drink. On Friday, we rented a Honda sedan with Interlude and took off to see the northern part of Long Island. There are several choices for car rentals here and we chose Stanley, a nice man who has 5 or 6 cars in his yard. Our first stop was the Stella Maris resort on the ocean side. It was a windy day and the waves were crashing on the shore. 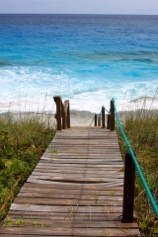 We walked around the beautiful old style Bahamian resort and then used their wooden steps to go down to the beaches. 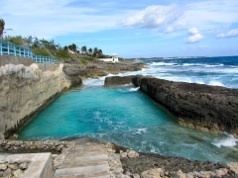 Part of the resort includes a salt water pool, with water flowing in and out from the ocean. It must have taken a lot of work to cut this large pool out of the rock and then make openings to let water from the ocean pour in and exit. On a calm day (see waves crashing over the sides) one could enjoy a swim in this pool. Steps lead down to it, but we didn’t venture there today. The facilities are fantastic, from the well stocked bar (above) to pools, exercise buildings, dining rooms, game rooms with pool table, beautiful room and cottages and much more. Prices are reasonable and this would be a great place to come for a peaceful vacation. 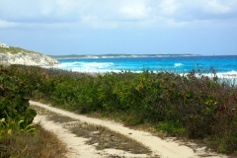 We pulled the car over to the side of the road a number of times, climbing down the hill to walk on a variety of beaches. Many were rocky with waves crashing on the steep shore but some were sandy. The rock formations on the beach had intricate lines and waves carved in them, making them look like works of art. We followed the signs to “Love Beach” wondering what it was. 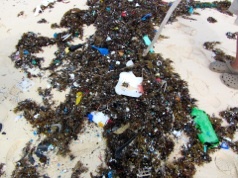 It turned out to be a sandy beach, marred with piles of shredded rubbish dumped from cruise ships and embedded in seaweed. Most of it was small pieces of plastic. Why they think it is better to shred it, I don’t know, but it would be much easier to pick up the garbage and dispose of it if there were larger pieces. Or, better yet dispose of it back in their home ports. The beach itself was beautiful and we found quite a few sea beans and hamburger beans. These are small dark beans which look like a hamburger bun. They come across the Atlantic Ocean from South America and Africa. 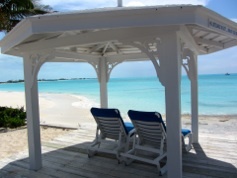 We continued up the coast and visited another resort, Cape Santa Maria, on Calabash Bay. 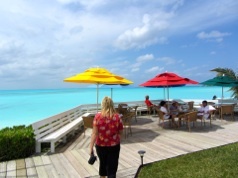 This is a more modern resort on the Exuma Sound side of Long Island. The shore is protected and the water is calmer. It is possible to bring a big boat in here and dinghy ashore, but usually there are swells which round the tip of the island and enter this bay. We saw two large motor yachts anchor and proceed to rock back and forth. We might try anchoring there on a calmer day. We had lunch at the Cape Santa Maria Restaurant on a deck overlooking the bay and had one of the best meals we’ve had in the Bahamas. The lobster salad had a large amount of grilled lobster, mixed with avocado and various fresh vegetables. After we left here, we drove south and stopped at Harvey’s Bar and Grill for a drink. 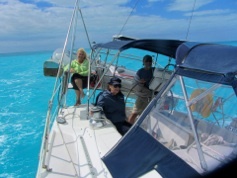 Here we met an amazing Canadian couple who own a condo at Cape Santa Maria. Pat and Bud entertained us with stories about their cruising adventures as well as information about Long Island. We learned that the residents here have the highest average education in the Bahamas. Pat, in her early years, cruised the world in a 65 ft sailboat. This was before GPS, chart plotters and all the navigation aids we have today. She met Bud later in life and he doesn’t like to sail, so they purchased a motor yacht and keep it in Canada. After enjoying their company for awhile, we had to leave to return our rental car to Stanley. He gave us a box full of fresh organically grown vegetables from his garden. He told us he provides them to the very restaurant we had lunch at today. Click here for more photos of our car tour of north Long Island. On Saturday, we joined Interlude for our third race with them. This took the place of the cancelled race during the rally from Georgetown on Wednesday. We raised the sails and went 4 1/2 miles south along the coast of Long Island, rounded a buoy and returned to the starting point. Mark was at the helm for most of the northern leg and did quite well, while Tom trimmed the sails. My job, once again, was relaxing and enjoying the sail. At times we heeled with the rail almost in the water but it wasn’t as uncomfortable as I thought it would be. We came in fourth place in our class, missing 2nd and 3rd by one minute in the @ 1 1/2 hour race. We so rarely get to turn off the engines on Seas the Day, so this was a real treat for Mark and me. At 5 pm we all gathered at Long Island Breeze for Happy Hour. 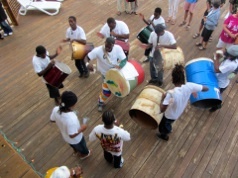 We watched a rousing performance by a local Junkanoo band. This was followed by a delicious dinner of either steak or grouper and a choice of two sides from peas and rice, mixed vegetables, cole slaw, potato salad or macaroni and cheese. We had the steak and it was excellent, as were the sides and the cake we had for dessert. After race awards were presented, Rockin’ Ron and Cool Karen started the music for the dance. Today many of the boats left for various destinations. We will stay a few more days. This afternoon we joined a group on the deck at Long Island Breeze for Texas Hold’em Poker. I think they must be a bit desperate for players to invite us. However, the last (and first) time we played back in Big Majors on Pretty Penny, Mark and I were the final two players and I won. Today, luck was on my side again and I came in second. The wind has calmed down considerably and it will be nice all week long. In a day or two, we are going to move Seas the Day and Interlude a few miles north to Miller’s Bay. 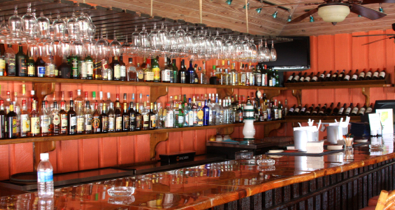 We’ll anchor and go ashore to have lunch or dinner at Chez Pierre, one of the top restaurants in the Bahamas, and as the name hints, has a French Chef. That’s the extent of our plans, but by the beginning of April we will be back in Georgetown to check in at Immigration to be granted the rest of our time in the Bahamas. We’ve already paid our $300 fee for six months, but they only gave us three months and we now have to renew it. Crazy! There is no rhyme or reason as to how many days you are “given.” Some cruisers get the full 180 days and others get three months or less. A friend who checked in at the same place in Bimini a few days after us got 180 days. Last time we came here we got six months.